Mike Connors studied drumming at Berklee College of Music in Boston with jazz greats Joe Hunt and Alan Dawson, and studied privately with Joe Hunt and Bob Goulotti. He performs not only on drums and percussion, but also on vibraphone. 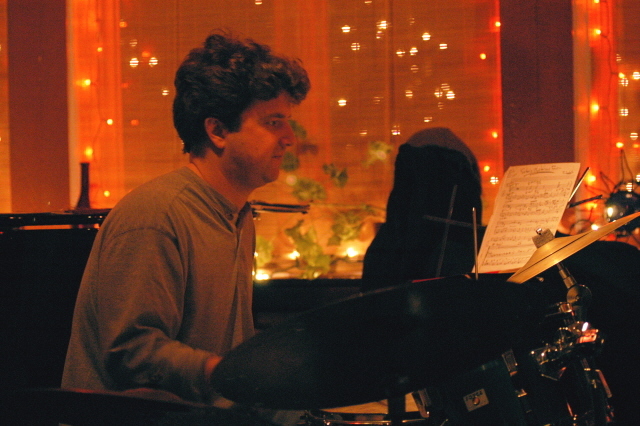 As a freelance musician, Mike is one of the most sought after drummers for jazz, rock, folk, and world ensembles. He performs locally and throughout New England with many groups, including the Sonic Explorers and Industrious Noise. He has also toured nationally with several Broadway shows including “Bye Bye Birdie” and “Anything Goes” (the Lincoln Center version). His international touring includes performances with the avant-garde pop group Combustible Edison, the 1999 Lilith Fair and Lisa Loeb as well as a Caribbean tour with trumpeter Andre Rice and his Sextet. Mike has also played on numerous television and movie soundtracks, including “Inspector Gadget”, “Fear and Loathing in Las Vegas”, “Gas Food Lodging” and “Four Rooms.” Mike teaches drums, percussion, and mallets at the Joy of Music Program in Worcester, MA as well as the Rivers School Conservatory in Weston.